I picked up a variety of items as part of the Dave and Adams Cyber Monday promo. I am leading off with a look at a non-baseball Hobby Box. I watched a good bit of the 2014 Olympics coverage. In addition to the competition, I was also interested in the events because of the venue. Mrs Phungo has been to Russia a number of times. One of her trips there took her to Sochi, site of the 2014 Olympics. When I saw Topps would be producing an Olympic set, I figured I would look into a set when the price was right. That time came on Cyber Momday. For our base card we take a look at the #84 card of Kaite Uhlaender who we discussed back in February. Uhlaender just missed getting a Medal, finishing 4th in the Skeleton. 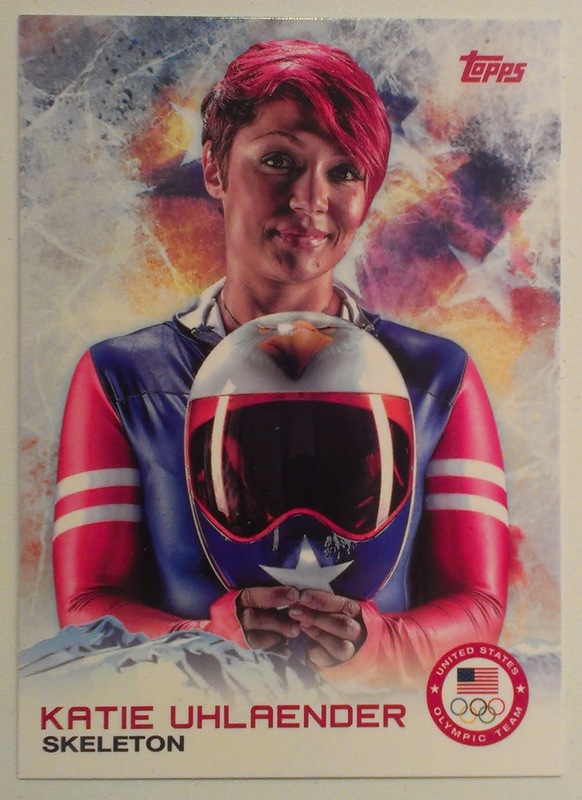 The cards are nice looking, There is a flag behind ice motif going on, rather than a frame the bottom of the card is separated by a mountain range which serves as a backdrop for text of the athletes name and event. The US Olympic logo appears in the bottom right. The picture themselves vary mostly casual pix like the one of Uhlaender above, but there are also action and head shots. Prior to the 2014 Olympics we knew Lolo Jones as a Hurdler in the Summer Olympics. 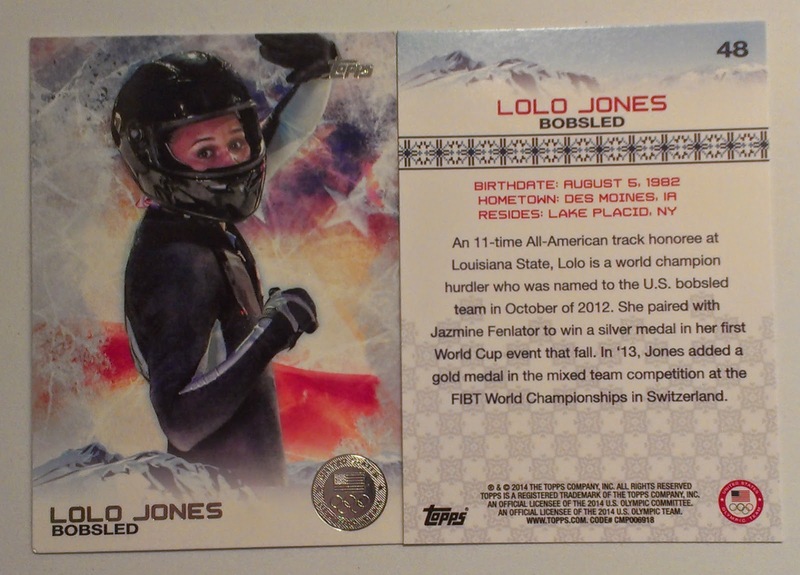 This year we were re-introduced to her in the Bobsled event. Her card above is a silver parallel - this is signified by a "Medal" in the lower right. I have paired Jones' card with it's b-side which contains a few biographical tid bits. In a nice bit of continuity the design on the b-sde echoes the mountains from the bottome of the a-side. 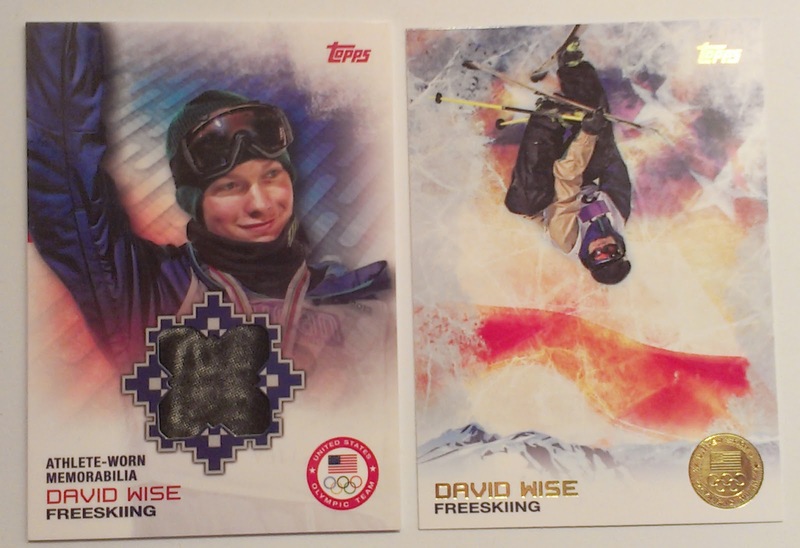 Paralympians are also featured in the 2014 Topps Olypic set. 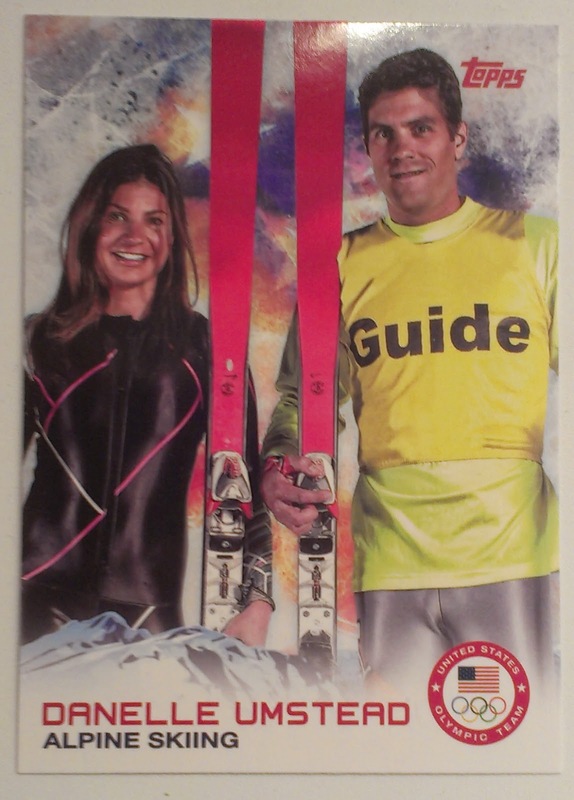 The visually impaired Danelle Umstead won a Bronze medal at the 2014 Paralympic Winter games. According to her Team USA bio Umstead's Guide since 2008 has been her husband Rob. The Topps card doesn't specify if the man featured in the above photo is Rob. 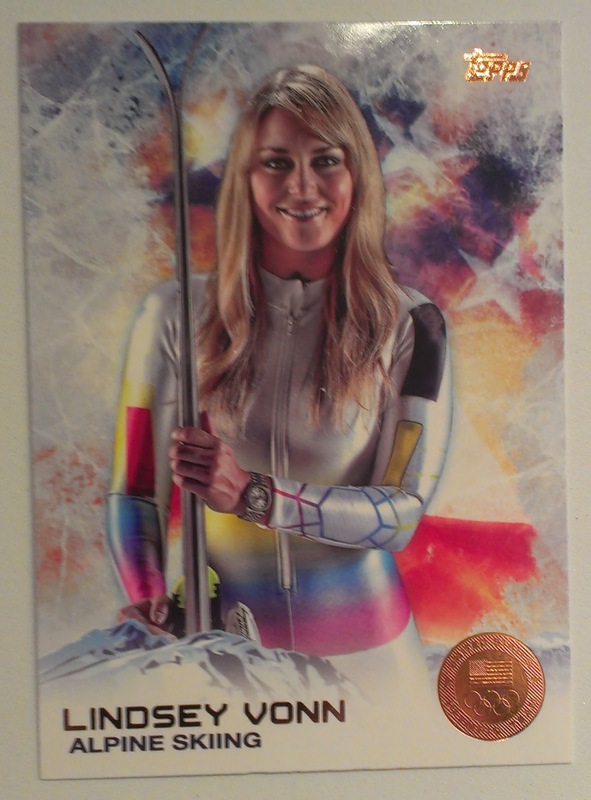 For our example of a bronze card we present an Olympian most sports fans are familiar with, Lindsey Vonn. Vonn failed to Medal this year but did take home a Gold in 2010. Eduardo Alvarez is another athlete we features in February. After the Olympics concluded Alvarez followed in his brothers footsteps and returned to playing baseball. Eddy put together an impressive debut batting .346 with 5 homers across 2 levels in the low minors. Alvarez is in the White Sox organization and will be an interesting prospect to follow in the next couple of seasons. 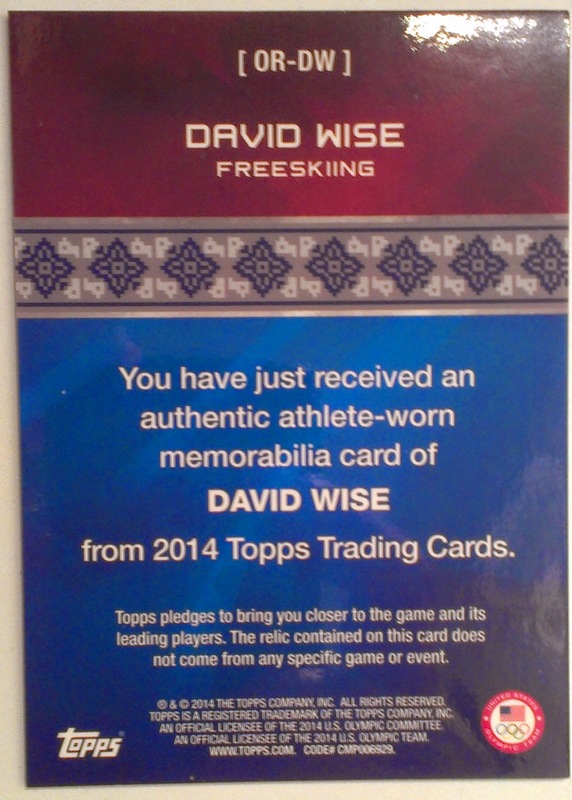 I got a picked up a bit of a David Wise hot-pack. 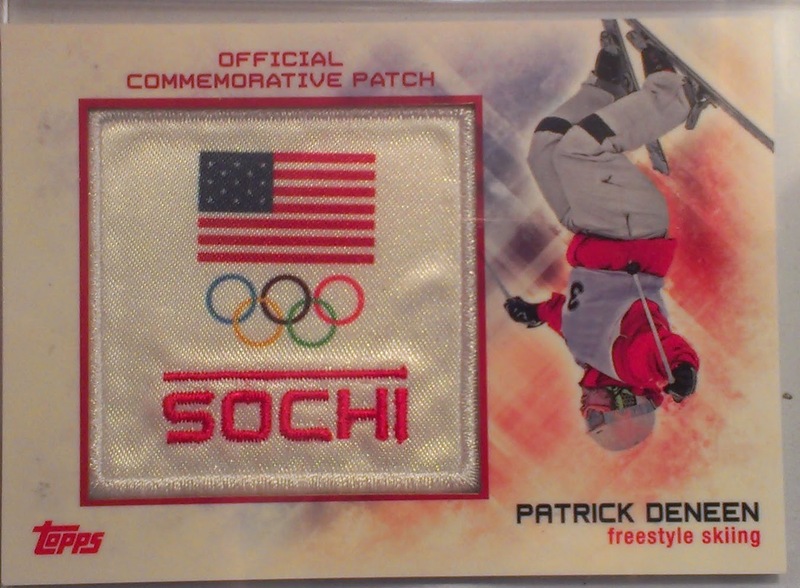 The Box Relic was a Wise as was one of the four Gold Medal Cards. The Medal Card is appropriate as Wise took home the 2014 Gold in the Half-Pipe. It's a manupatch but I like it. The pix featurs Patrick Deneen doing a flip, which through me off a bit. I thought Topps had put the swatch in upside down. Took me a second, but I figured out the orientation eventually. Oops buried this a bit. Each Box contains one auto "on average". 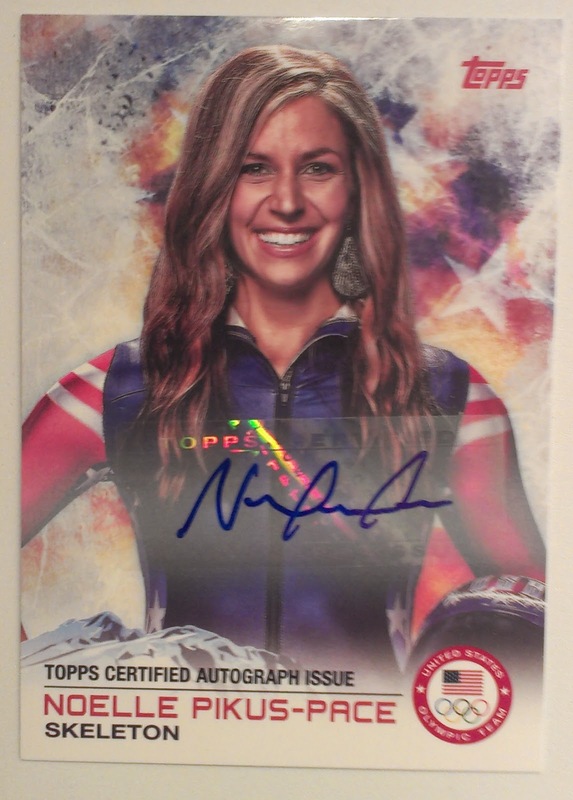 We had the good fortune to pick up an auto of Noelle Pikus-Pace. Yeah I didn't know her either. She took home the Silver in the 2014 Skeleton. This is the same event in which Katie Uhlaender at the top of our post just missed medalling. There were a few other insert cards, but I have elected to not present them here. 4 Gold - All parallels fell at expected odds. Would definitely liked a box or two of that. My son and I are trying to get the complete auto/relic set. Thanks for showing! 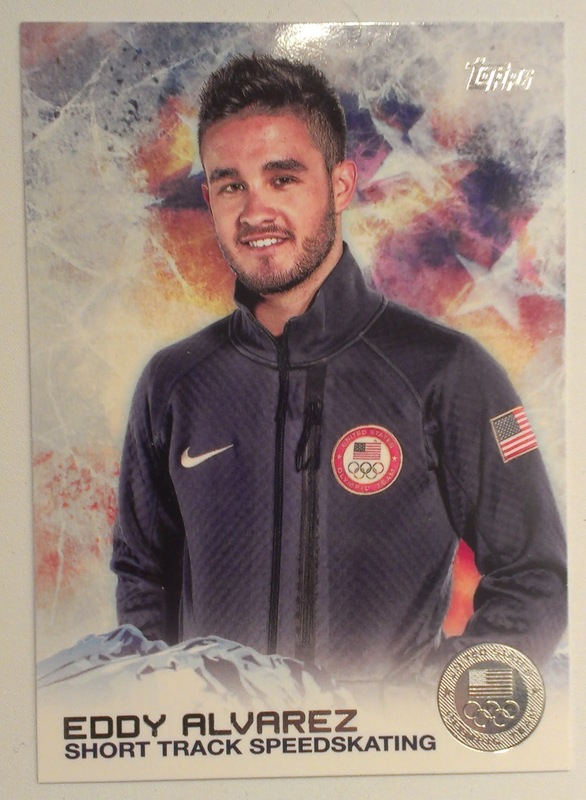 I pulled a copy of that Pikus-Pace card from a blaster and sold it before the Olympics for the price of your box. I do like the set. These are super awesome. I had 8 discount blasters from Walmart this summer that I did crazy good on. Absolutely love this set. I've found 3 discounted blasters ($11.98 each) over the last 2 days at local walmarts. My hits were: 1 Lindsey Vonn relic, 1 Lindsey Vonn base auto, and 1 Lindsey Vonn bronze auto #16/50.